MPVs: Ford - Hyundai | What Car? Fords B-Max is more radical than most small MPVs. The production version will be all but identical to the bold concept car shown here. The addition of door handles and subtle changes to the light lenses and front grille will be the only significant changes, although a quarterlight will also be added to the rear doors. The B-Max has the higher trapezoidal grille that characterises Fords latest design language. The face-lifted Fiesta, which is due next autumn, gets a similar look. One of the most unusual aspects of the B-Max is the sliding rear doors that aid access in tight spaces. Even more radical is the absence of a central pillar, which makes getting in and out easy. Under the skin, the B-Max shares much with the Fiesta, so it ought to be good to drive. The engine range includes Fords new three-cylinder 1.0 Ecoboost petrol engines. Two versions of this engine, with around 99 or 118bhp, will be available. Ford says performance will be equivalent to that of a conventional 1.6 petrol, but CO2 emissions will be much lower, with sub-120g/km figures suggested. Inside, theres generous headroom, and rear seats with a 60/40 split/fold function that lie flat to create a flat load space. 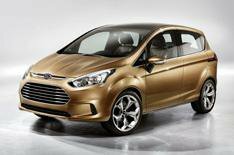 Fords C-Max MPV will be one of its first models to get its new 1.0-litre Ecoboost petrol engines. There are 99 and 118bhp versions, with five- and six-speed manual gearboxes respectively, and both are likely to be available in the C-Max. The larger, seven-seat Grand C-Max may get just the higher-powered version. Ford is aiming for sub-120g/km CO2 emissions in its smaller models, but the C-Maxs figure will rise slightly. The C-Max Energi a plug-in hybrid with a 2.0-litre petrol engine and an electric motor is due in the UK in 2013. Hyundai will enter the compact MPV market when it launches a new i30-based model at the end of the year. Under the skin, the new car which has no confirmed name as yet will share its engine and most mechanical parts with the all-new i30. A choice of 1.6 petrol or diesel engines are likely to be offered and start-stop is likely to be fitted as standard. The i30-based MPV will have a taller, longer body than the hatchback to provide more cabin space and wed expect a seven-seat interior, with the rear five all able to fold flat for maximum load space. The exterior styling will follow the themes set by the i30 and i40, and will also borrow from Hyundais HED-5 concept car. Kia is expected to launch a closely related model, which will replace the Carens.